Pentek's New Model 5950 is a high-performance 3U OpenVPX development board based on the latest Xilinx Zynq UltraScale+ RFSoC FPGA. The corresponding Model 6001 Quartz eXpress Module (QuartzXM) with its complete design kit provides a high performance system-on-module (SoM) measuring only 2.5 by 4 inches. 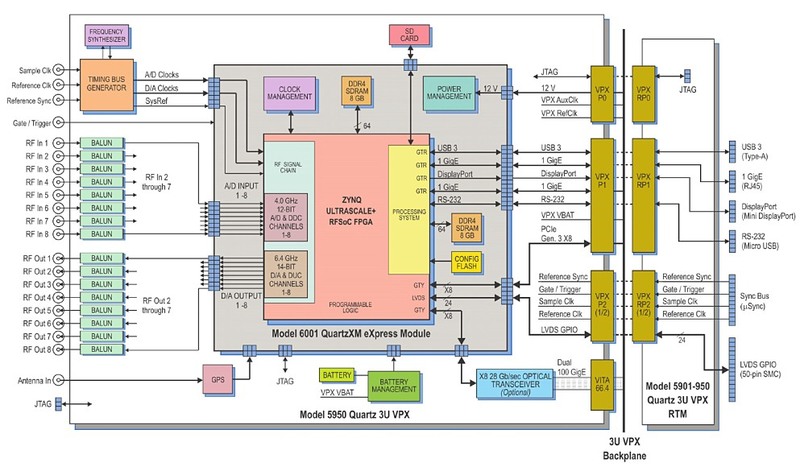 The QuartzXM Module includes all the circuitry needed to maximize the performance of the RFSoC. It can be housed on the Pentek 3U VPX Model 5950 or it can be deployed on a custom carrier. 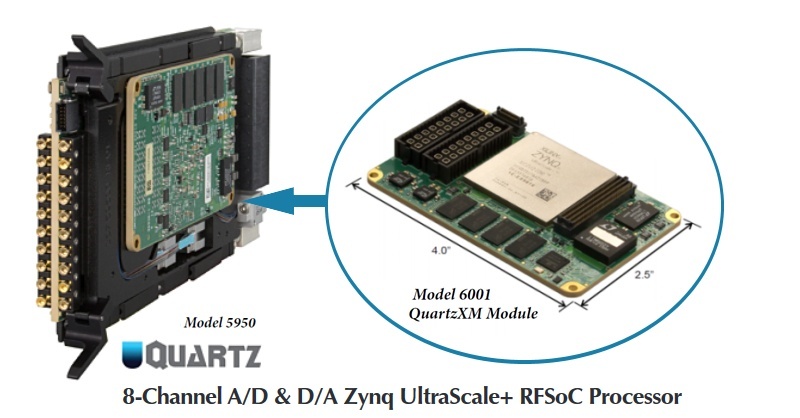 The RFSoC with its All Programmable SoC architecture integrates eight RF-class A/D and D/A converters into the Zynq’s multiprocessor architecture, creating a multichannel data conversion and processing solution on a single chip. Complementing the RFSoC’s on-chip resources are the 5950’s sophisticated clocking section for single board and multiboard synchronization, a low-noise front end for RF input and output, up to 16 GBytes of DDR4, a PCIe interface, a gigabit serial optical interface capable of supporting dual 100 GigE connections and general purpose serial and parallel signal paths to the FPGA. The key to unlocking the potential of the RFSoC is efficient operation using optimized IP and application software. Model 5950 is supported by Pentek's Navigator Design Suite (BSP & FPGA Design kit), which provides a full suite of built-in functions to address the data flow and basic processing needed for some of the most common applications. Example applications are included (with full IP) for High Bandwidth Data Streaming, Waveform and Radar Chirp Generator and Multi-mode Data Acquisition System. Pentek’s Navigator Design Suite includes the Navigator FDK (FPGA Design Kit) for integrating custom IP into the Pentek factory-shipped design and the Navigator BSP (Board Support Package) for creating host applications. The Navigator Design Suite was designed from the ground up to work with Pentek’s latest board architecture and provide a better solution to the complex task of IP and software creation.